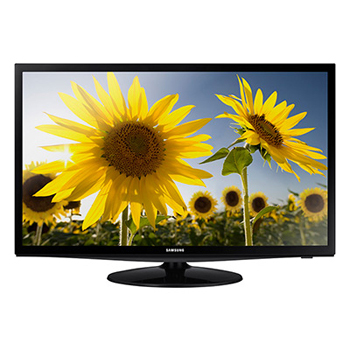 The 28 inch Samsung UN28H4000 features a 720p screen. Those resolutions may scare some people off in a world where 4K is becoming the standard, but there is no reason to worry. A 28 inch screen really doesn't need a 1080p resolution unless it is going to be acting as a computer monitor. The main reason is that most broadcasts and video games are still 720p. It is beginning to change but that won't render the TV useless by any means. The 60Hz refresh rate seems a little low, but it surely keeps the cost down on this one. Motion blur and judder are not going to be highly noticeable on a screen this size as well. Those who are looking will see it, but only the most sensitive to the issue will be bothered by it. Side viewing angles on the H4000 perform just as you would expect them to on a low end model. We see contrast and color begin to face at about the 30 degree mark. This is typical for LCD/LED TVs and this one is not plagued by terrible viewing angles. The UN28H4000 may have a pretty plain appearance, but we don't expect much more from the bottom of the line model. The bezels and profile have a little more width than the step up models. The stand is round black plastic on this one instead of the typical black sqaure. It's good for those who don't want anything too flashy.